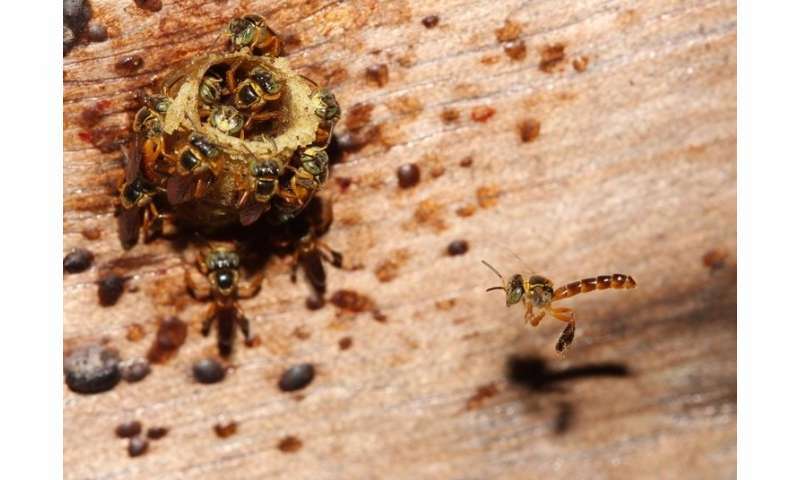 The Brazilian stingless bee Tetragonisca angustula (jataí in Portuguese) deploys a different strategy for defending its nests from other social insect species. In addition to posting sentinels at the nest entrance, as do most social insects, colonies of this species also have guards that hover near the entrance at all times. The study resulted from a project supported by São Paulo Research Foundation - FAPESP and was published in the journal Behavioral Ecology. "Relatively little research has been done to find out whether the level of collective vigilance increases if the group coordinates its vigilance efforts, by monitoring different directions, for example, as we found in this study of stingless bees," said the researcher. Vigilance in social insects, she added, differs from vigilance in most gregarious vertebrates. Unlike groups of fish, birds or mammals, which can flee predators, social insects must protect their nests, which are typically in a fixed location and contain reproductive individuals, offspring and food stores. Moreover, early detection of predators is important for social insects because the first predators to arrive are often scouts from colonies of other social insects, and these individuals can recruit nestmates for a mass attack. "Whereas individuals in a herd, flock or shoal may not be kin, guards in groups of social insects must always be vigilant because their survival depends more on survival of the colony than on their own personal safety. Altruism therefore probably 'facilitated' the evolution of coordinated vigilance in the case of social insects, particularly as the nest contains their genetic heritage—mothers and siblings—as well as stores of food," Alves said.